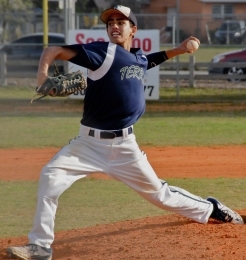 Alexis Valladares recorded 13 strikeouts in Tuesday’s win over Ransom Everglades. Alexis Valladares struck out 13 and allowed one hit as the TERRA Institue Wolves blanked Ransom Everglades 3-0 on Tuesday to earn their first win in District 4A-15. Ransom Everglades countered with a resilient defense of its own, holding the Wolves to three runs and five hits. TERRA Institue stifled Ransom from the opening pitch. The Wolves engineered a quick three-and-out, Valladares carried that momentum into the second inning, forcing a 6-3 ground out and two strikeouts to end the inning. Valladares seemed to be just warming up as he sat down the first two batters to start the the third inning. In search of the Wolves’ third consecutive 1-2-3 inning, Valladare recorded his sixth strikeout, but the pitch was dropped and overthrown at first. Valladares, however, retorted with his seventh K and six straight strikeout. Ransom Everglades had no answer for TERRA’s defense, but the Wolves likewise were held stymied early and held hitless through the first two innings. Freshman Andres Perez changed that with one swing of the bat as he led off to start the bottom of the third and sent his first high school home run over the left center-field fence. A couple batters later, the Wolves walked Nick Lopez, setting up Angel Mestre for an RBI single and putting the Wolves up 2-0. Valladares proved to be imperfect in the fourth after giving up a hit to left field. Valladares regained his composer and confidence in his curve ball for back-to-back strikeouts to end the inning. The Wolves ace struck out the first three batters he faced in the fifth inning and garnered his 13th strikeout in the sixth inning. 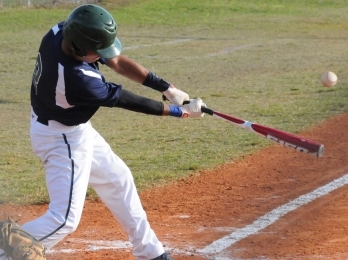 The Wolves received a big solo home-run by Andres Perez in the third inning. In the bottom of the sixth, Angel Mistre pulled a pitch down the left-field line for a double. Rueben Pino, Terra’s 2012 leader in hits and RBIs, followed with a blast to center field for a double, bringing in Mistre for the Wolves’ final run. Ransom Everglades fell to 1-1 on the season and 0-1 in district play.